Marketing Info | Citrus Products of Belize Ltd.
Citrus fruits are produced all around the world. According to FAO data, in 2004, 140 countries produced citrus fruits. However, most production is concentrated in certain areas. Most citrus fruits are grown in the Northern Hemisphere, accounting for around 70% of total citrus production. Main citrus fruit producing countries are Brazil, the Mediterranean countries, the United States (where citrus fruits for consumption as fresh fruit are mainly grown in California, Arizona and Texas, while most orange juice is produced in Florida) and China. These countries represent more than two thirds of global citrus fruit production. Oranges Brazil, United States, Mexico, India, Spain, China, Iran, Italy, Egypt, Indonesia. Small citrus Nigeria, China, Syria, Guinea, Japan, Saudi Arabia, India, Sierra Leone, Angola, Tunisia. Lemons and limes Mexico, India, Iran, Spain, Argentina, Brazil, United States, China, Italy, Turkey. Grapefruit United States, China, South Africa, Mexico, Israel, Cuba, Argentina, India, Turkey, Tunisia. In the Mediterranean countries, citrus fruits are produced mainly for fresh fruit consumption. Spain is the leading producing country in the area. USA and Brazil are the leading producing countries of processed citrus fruits. In United States most of the production is consumed domestically. Actually, domestic consumption of orange juice is higher than US production. However, they still play a role as fresh citrus fruits exporter although the share of these exports versus domestic production remains at a relatively low level, between 5% and 7% in the early 2000s. 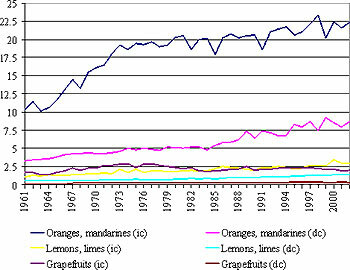 Between 1978/79 and 1999/00 the percentage of exports of fresh oranges over domestic production ranged from 20 to 30 percent. In Asian countries production of citrus fruits is mainly consumed domestically. 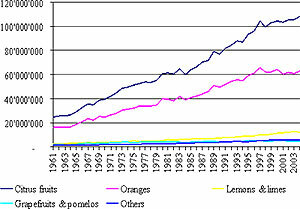 As the following chart shows, citrus fruits are mainly consumed in developed countries, although consumption per capita is increasing in developing countries as levels of income increase. There seems to be certain stagnation of citrus fruits consumption in developed countries. According to FAO, fresh orange consumption is declining in developed countries mainly due to two reasons: it is being replaced by orange juice consumption and improvements in transportation and storage favor wider and longer availability of substitute fruits. However, fresh orange consumption expanded in many developing countries, especially in emerging economies such as Mexico, India, Argentina, Brazil and China. Citrus fruits processing accounts for approximately one third of total citrus fruit production. More than 80% of it is orange processing, mostly for orange juice production. The major feature of the world market for orange juice is the geographical concentration of production. There are only two main players: the State of Florida in the United States and the State of Sao Paulo in Brazil. Production of orange juice between these two players makes up roughly 85 percent of the world market. The major difference between them is that Brazil exports 99 percent of its production while 90 percent of Florida’s production is consumed domestically and only 10 percent is exported. International trade in orange juice takes place in the form of frozen concentrated orange juice (FCOJ), in order to reduce the volume used, so that storage and transportation costs are lower. The European Union is the largest importer of orange juice, accounting for over 80% of world orange juice imports. Most of imports by the EU and Japan come from Brazil. In North America, the United States and Canada consume mainly orange juice from Florida, while a small quantity of imports comes from Brazil. The two main citrus fruits grown in Belize in commercial quantities are orange and grapefruit. Like citrus production in the rest of the world oranges represent the larger production percentage in Belize as well. 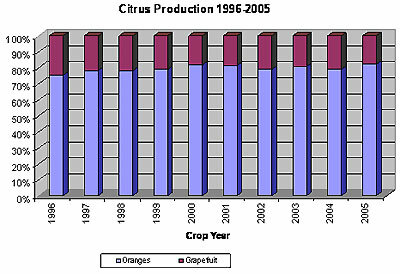 In the last Crop Year 2004-2005 (Oct-Jun), oranges accounted for 82% of the total production which is indicative of the citrus industry’s recent history as well. Traditionally, orange juice, frozen concentrated (FCOJ), pasteurized (NFCOJ) and Freeze (FrCOJ), account for 75-80% of the all sales of citrus juices and citrus by-products. 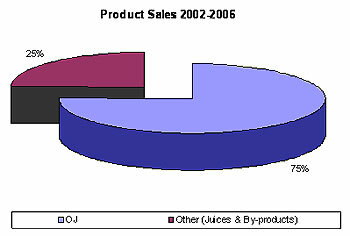 The United States of America remains the largest export market for Belizean Orange Juice, accounting for 50% to 60% of the total sales, and slowly increasing in recent years. 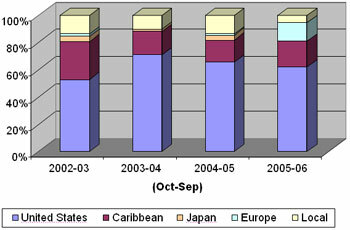 The second largest market is the Caribbean followed by the local market. With a population of around three hundred thousand, locally sold orange juice is expected to decline in years to come as the orange production per capita is expected to increase. In addition, the populace seems inclined towards the fresh fruit market which has proven to be the more economical choice. Japan could be characterized as a small niche market for Freeze Concentrated Orange Juice (FrCOJ) only, but with the emergence of eastern suppliers and a more tolerable palette, the market has all but disappeared. A striking contrast is the European Market, where for the first time in more than 5 years Frozen Concentrated Orange Juice (FCOJ) was exported, where the market has always been more inclined to Frozen Concentrated Grapefruit Juice (FCGJ). Some core and by-products are also sold in bulk form. Uptake splits being 90% orange juice concentrate and 10% orange oils & essences. Mature market with a greater degree of balance between orange and grapefruit concentrate, juices and by-products. Rapidly developing market for core products transitioning from freeze concentrated juices to frozen concentrated juices. Growing as a group with the addition of customers in Puerto Rico, Dominican Republic, Guatemala, El Salvador, Honduras and other Central American interests.